Miami at Christmas time? What a stupid move. Clubs are packed with twenty year-olds and their Cuban sugar daddies, the ocean is too cold for even a dip and screaming kids with weary parents slosh wildly in hotel pools. Fortunately, our Insatiable Reporter Sylvie Bigar can turn any nightmarish vacation into a winner - just give her a fork. Frozen stiff by too many New York winters spent at Sapore di Mare in East Hampton and Pappardella on the Upper West Side, chef Pietro Vardeu took shelter at Enoteca Sardinia in Miami Beach. Clad in his red cap and Batali-like orange Crocs, he conducts and performs quasi solo at the massive wood-burning oven. Roasted crispy quail over lemony broccoli rabe, char-grilled juicy swordfish scaloppine, lightly baked octopus and Stone Age portions of rib-eye steak evidently turn on the hip and mostly Italian crowd. The Sardinian flat bread in its rosemary robe is addictive and the veal polpettine as memorable as the best ever I remember eating in Ravello. A sure bet. This newcomer on Lincoln Road, where hot twin chefs Nicola and Fabrizio Carro from Piemonte appear for the first time in the U.S., is a score for four hands. The stunning interior, designed around a towering bar flanked by two floor-to-ceiling glass-enclosed wine armoires, serves as the jewel case for some well-executed Northern Italian specialties prepared with fortissimi ingredients. 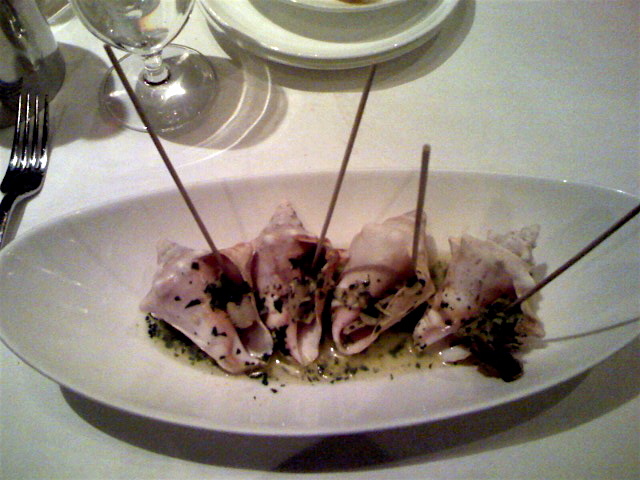 Meat or pesce spada carpaccio, authentic vitello tonnato and homemade pasta: An Insatiable Hot List for one crisply brazed branzino baked in salt crust. Even the outdoor space in the center of the mall reads like an island of civility and sophistication. 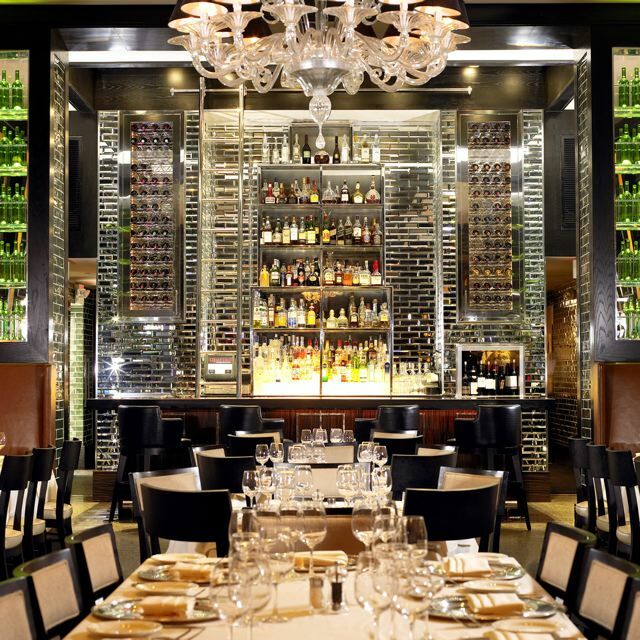 Jet-setters and foodies alike savor the exceptional regional wine list. In the fashionable Upper Eastside of Miami sits Michy’s, the one year-old eatery of ex-ballerina-turned-cook Michelle Bernstein, who first impressed me at Azul in the Mandarin Oriental, way before her Food Network stints. The chef packs them in on orange banquettes with her clever take on Latin cuisine blended with Caribbean and French touches: An intense duck consommé with duck confit raviolis afloat and a foie gras domino, conch served in their pinkish mini-shells prepared as escargots, croquetas made with blue cheese, a carbonara laced with warm St. Andre. The short ribs draw sensuous sighs. Almost every plate can be ordered as a half-portion, so you can dine mezze-style. Art Basel has moved on and even though Miami is teeming, the design district at night can be as empty as a blank canvas. Thankfully, rumor has it that several restaurateurs are moving in following pioneer chef Michael Schwartz. Riding the current wave of local and sustainable, he offers small, medium, large and XL plates as well as snacks and sides. Chicken liver crostini and deviled eggs deliver more weight than stars but I can’t stop digging into a bowl of crispy hominy. A hefty portion of the spicy pork belly offers a good balance of crusty fat and picante meat. The pan roasted “poulet rouge” flies high above the flock. A lighter touch with desserts would work wonders. Among all the street-level glitter and icy futuristic architectural beauty of the Miami skyline, it’s reassuring to know that culinary traditions can last here too. One of the oldest Cuban diners, Puerto Sagua serves the best croquetas in town, a deep and dark black bean soup, delicious steak palomilla with comfort rice and sweet plantains, and fresh shrimp with salsa verde. Cold beer and intensely silky flan make-up for the desiccated chicken breast sandwich I couldn’t bring myself to eat earlier in the day. 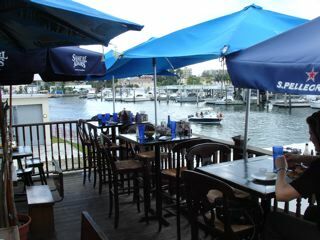 Garcia’s is a favorite dive on the Miami River. Photo: Sylvie Bigar. Leave the human circus parading on Lincoln Road and dip into the real Miami. At Garcia’s Seafood Grille on the Miami River, one of my favorite dives, the conch fritters crunch up and the seafood chowder channels a mini-bouillabaisse. Order a grilled grouper or dolphin filet moist with lemony pepper sauce snuggled on a Floridian bun (plump and tanned golden) and try to snag a table on the second floor terrace to check out the yachts and pelicans. Mama Garcia’s machete on the crab claws is intense and relentless. Who needs the two-hour wait at Joe’s Stone Crab? 398 NW N. River Dr. (NE Second Ave.) 305-375-0765. Stone crab prices vary but budget at least $30 for two jumbo crab claws. Just in case your car needs a wash and you crave pizza at the same time, head to Andiamo! Just south of the design district, Mark Soyka of News Café fame has turned the front section of this authentic 1960’s car wash into an indoor/outdoor funky eatery. No question it serves the best pizza in Miami, from its chewy fresh dough to the variety of toppings: paper-thin prosciutto, arugula, goat cheese, even truffle oil. The service may be Miami laissez-faire but the wait is worth it. The secret’s in the dough - fresh-made every morning, with simple ingredients like olive oil and flour. Remember those? 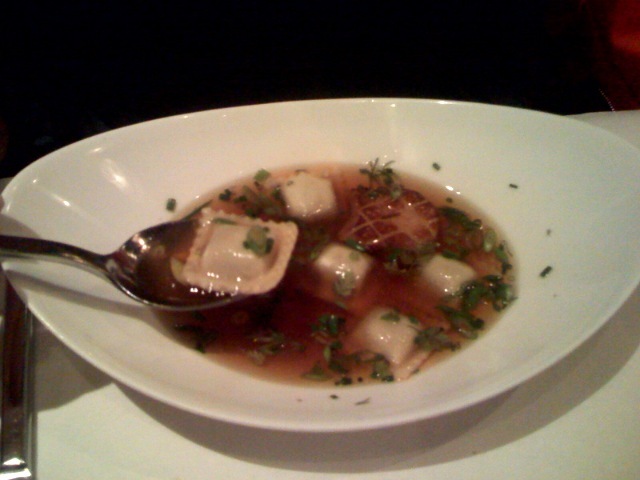 Sylvie Bigar reviews restaurants for New York Resident and Gayot.com. Her articles have appeared in the New York Times, Food Arts, Town and Country, Time Out New York and The Southampton Press. She also writes in French for Le Temps, her hometown newspaper in Geneva.